Even though Ari Hoenig learned how to play the violin and the piano prior to the drums and even though he is a very musical sticks magician, Ari’s biggest love are skins and metals. Recently I invited myself to one of his gigs. 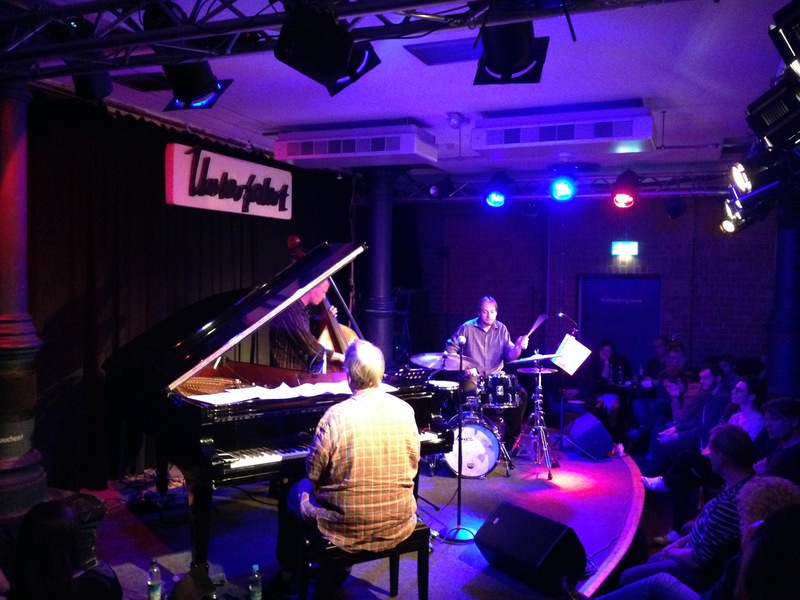 Ari was stopping by in Munich to play and also record a new album with the Kenny Werner Trio. He took me entirely by surprise when he asked me, if I had some Bosphorus cymbals for him to borrow. Ari Hoenig travels light. And I remembered when I received a dressing-down from a teacher many years ago, because I didn’t bring my own cymbals and apparently didn’t care about my own sound. Anyway, one topic, many opinions and a great sound later that night at the gig … with some borrowed Bosphorus’. 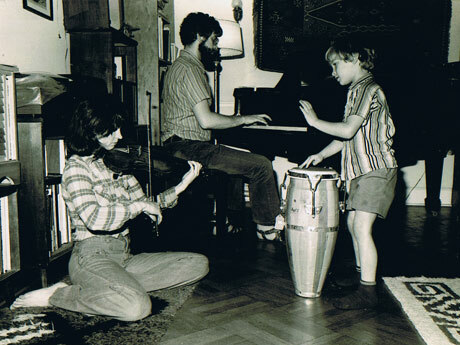 Ari’s musical parents and himself as congaeiro at age four. Ari Hoenig is an adventurer, who loves to explore music. He is also one of those lucky fellows, who grew up with parents which were musicians. And he is one of those talented drummers, who studied with the legendary educator Ed Soph at the University of North Texas. Keith Carlock also went there to learn very important lessons. 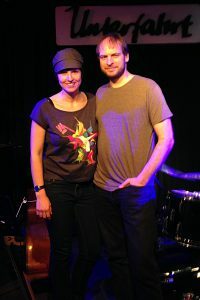 Moving to New York in 1995 was the right move for Ari Hoenig. This place offers enough room for the drummer and composer to explore. He does do so as a sideman as well as with his own trio, quartet and the Ari Hoenig Nonet. In 2013 he even won the BMW Welt Jazz Award. If you are not from New York, haven’t visited either and didn’t catch Ari on a tour around the world, he left traces of his artistry on many records. His eleventh album as a leader The Pauper & The Magician was just released this year. 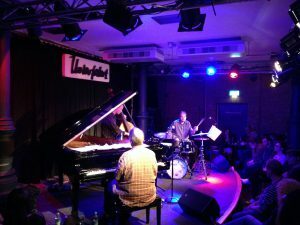 The well attuned Kenny Werner Trio with Ari on drums at Munich’s jazz club Unterfahrt. When I saw Ari Hoenig play, I wondered what he was thinking. His appearance behind the kit is unique at most times: a paradoxical mixture between The Hunchback of Notre Dame and Kevin Home Alone. Even though he’s very focused, serious and driven, at the same time he is very relaxed, spontaneous and floating. Exciting! Drummers usually are experts when it comes to rhythm, so is Ari Hoenig. But he’s more, he’s a king of rhythm. I had already heard about it. Not for nothing did he publish two educational books on that matter. He collaborated with bassist Johannes Weidenmüller, whom you will also see in the video. 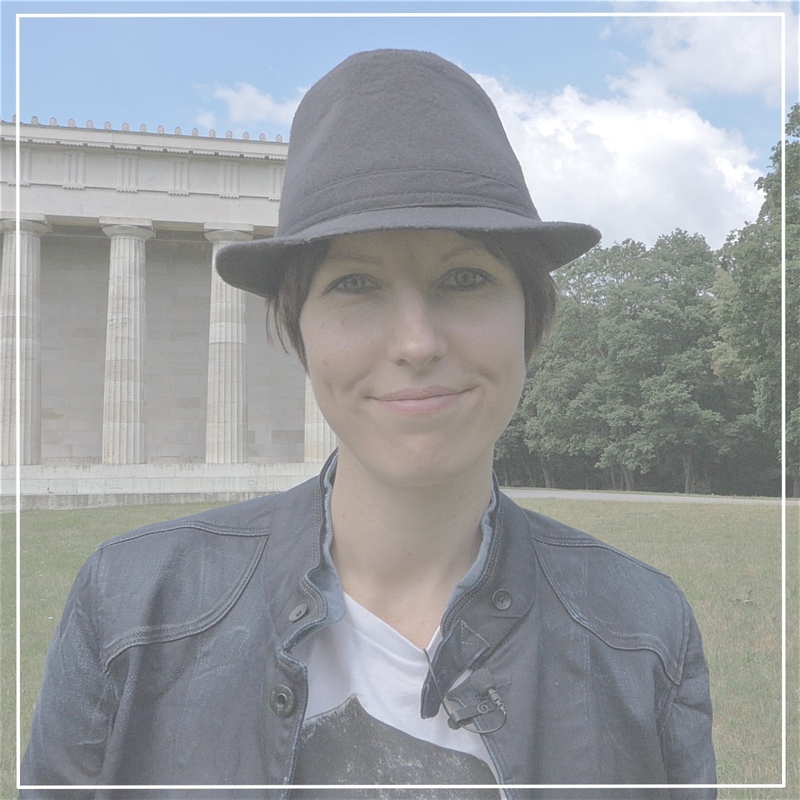 So when we met before Ari’s gig with the Kenny Werner Trio at the Unterfahrt in Munich, I got a taste of how Ari practices on the road or just anywhere. Instead of working on his speed, he prefers to explore the world of rhythms. He loves rhythm games. And in this video he gives you two examples of what you can do, within a bar of four-four or a bar of three-four time. He even quickly adapts his ideas within a musical setting. If this quick treat is too fast for you, Ari Hoenig also teaches: privately, at the New York University and at the New School in New York. He’s also been a guest on My Music Masterclass, where he teaches three episodes of Rhythm Training. That’s a great site to check out, if you are serious about music by the way. But for now have a look at this video and get to know an outstanding drummer, you might not have heard of yet. Enjoy the exploring journey! A good idea in any case. I use to practice four-way coordination on my knees and with the feet silently under the table in boring meetings. With double advantage – it keeps you awake AND your drumming benefits a lot from the many extra hours of practice. 😀 Many more boring meetings for you, Mick. Hope to get to see you playing one day.